Not many items have changed the tattoo business more that the use of paper products for wiping the skin during the tattooing process. Up until the 1950s most tattooists used a sponge and a bucket of water for cleaning the skin before, after, and during the tattooing process. Once tattooists and health departments started to think in a "single service" way, the old sponge and bucket did not fit into this new health standard. There are stories that when a customer would ask about the cleanliness of the sponge and bucket, the tattooist would put out their cigarette in the bucket and say, "that sterilized it." 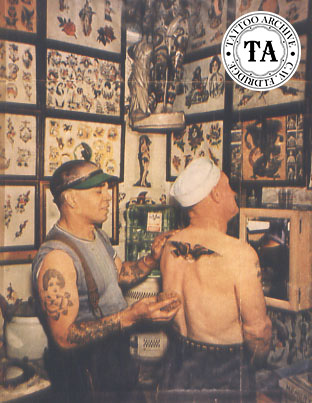 Many of the health standards in the tattoo world today were mandated by the military. Military brass realized that the troops were getting tattooed at local shops; and maybe some of them were ending up in sickbay with a sore arm. The military leaned on the local health departments to solve these sickbay problems. If this didn't work, there was always the threat that the tattoo shop would be off limits. As you can imagine this was the death knell for a tattoo shop near a military base. Generally tattooists would do whatever was necessary to comply with the demands of the Military, even if this meant totally revamping their tattooing process. Kleenex was invented out of the need to replace cotton, due to a cotton shortage just before World War I. Kimberly-Clark had been in the paper business since 1872, and in 1914 developed cellu-cotton, a cotton substitute used by the United States Army as surgical cotton during World War I. Made from wood pulp, cellulose and a small amount of cotton, this cellu-cotton was a big hit during the war for bandages and also worked as a nifty filer for gas mask. The war ended and the demand drop for cellu-cotton so Kimberly–Clark began looking for new ways to market this product. First marketed as a disposable wipe for cold cream and facial makeup removal, but the sales were flat. Then, thanks to a user questionnaire they realized that people were using them as disposable handkerchiefs. The buy-line then became, "Don't put a cold in your pocket." They never looked back! It is unknown who was the first tattooist to start using Kleenex in the tattooing process. 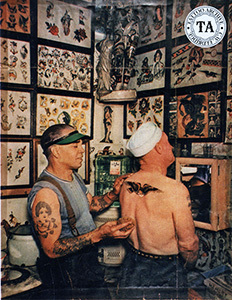 Around the time of World War II its use became more popular and some health departments added the requirement for the use of cloth in the tattooing process. Some tattooists still used cotton cloths for wiping but eventually health departments required something disposable and that was when the use of Kleenex took off. Today the use of Kleenex in the tattoo business is waning somewhat with the discovery of Bounty Paper Towels. Bounty was introduced in 1965 by Procter & Gamble as "thicker, softer, and more absorbent than any other on the market." Bounty has become so popular in the tattoo world that some tattooists have the Bounty logo tattooed on them!